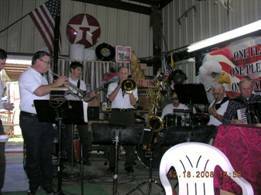 Many large families would have some of their members and relatives play the fiddle, guitar, accordion, harmonica, base, trumpet, tuba or some other instrument. 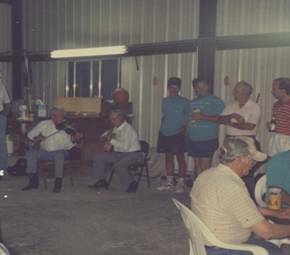 Steve Okonski was a famous musician and received an award for playing the fiddle for 70 years at weddings, reunions, and many social functions throughout state of Texas . 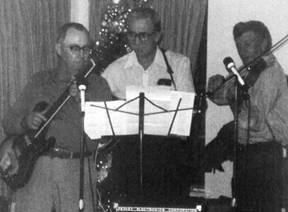 Polkas and waltz were his specialties. Neighbors would drive or walk their families to each other’s homes and usually sat on their porch or under a shade tree and just visited for 2 or 3 hours. They would share or trade some of their freshly canned fruit or vegetables, polish sausage, home brew, or white lightning and just relax. 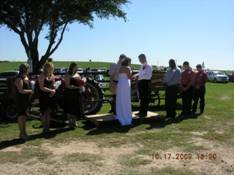 Some would get their horse and mule teams hitched to a wagon and would take a ride around the farm or down the road. Tractor and trailer hay rides around the farm or down the country roads were always a popular activity everyone enjoyed. 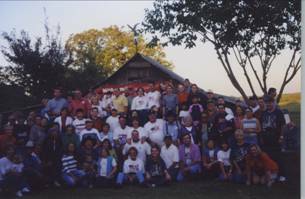 Some of the large families would get together with their close by relatives and played baseball against other families. 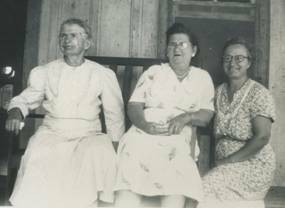 The Okonskis of Tidwell Prairie (see below) to include Harry, Steve, Pete, Louis, Billie and Bill Pietrowicz hardly ever lost a game against other families. 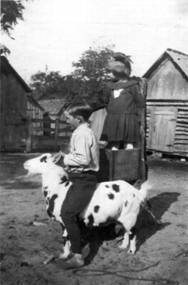 In the late spring and early summer months, the family was entertained by some of the various animals on the “Okonski Homeplace”. 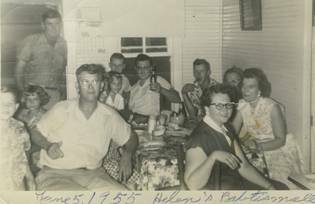 A couple of hours after supper or just after dark, the family would gather on the porch to have some dessert such as homemade ice cream, a big red float, or popcorn and wait for the evening country critters to entertain the family. The family conversations included what needed to be accomplished the next day and any important things that happened during the day. As all are enjoying their dessert, everyone is anxiously waiting for the Country Outdoor Theater to begin. Just after dark, a light bulb hanging in the tree about ten feet from the porch would be turned on. This was just enough light to attract the bugs away from the porch but not too bright to avoid seeing the moon and the stars. In a short while, the outdoor Country Theater began. The five dogs were playing in the yard and gradually were going underneath the house to lie down. The lightning bugs are seen flying through the yard. An owl begins to Hoot periodically. The coyotes howling seemed to be getting closer. The June bugs and several other moths began to fly around the dim light bulb hanging from the tree. A couple of them would periodically touch the light bulb and would fall to the ground as if they were wounded. The bugs began crawling around on the ground got the attention of a couple of toad frogs that were hiding in the damp sandy soil underneath the cistern. The cistern was next to the porch and was used to catch rainwater from the roof which was used for washing clothes and taking baths. The cistern had a lower faucet with a large marble rock beneath it that was utilized for rinsing off our feet after we returned from swimming in the pond. The sandy soil was damp and cool and a perfect hiding place and home for the toad frogs. Slowly a toad frog would hop towards the bugs on the ground to get their fresh juicy dinner. The frogs loved the bugs. Occasionally, a medium sized bull frog would take a huge hop and make its loud frog noise. All of a sudden, you can see one of the kittens from in the tree to slowly crawl down the limb and trunk of tree with its eye on one of the frogs for dinner. About two feet from the bottom of the tree trunk, the kitten would leap on the ground and dash toward a frog. The race was on and the toad frog would usually make several large hops back underneath the cistern to safety. You could see the toad frog digging itself in the sandy moist soil underneath the cistern. About, that time you can hear a couple of dogs barking and running toward the kitten. The kitten narrowly escapes and runs up the tree trunk. The dogs are now jumping on the tree trunk trying to catch them probably for dinner. The dogs finally give up and go back underneath the house to their bed boxes. After ten to fifteen minutes of quiet time, the bugs are still dropping to the ground. e. If another toad frog was hungry the show would repeat itself. Act II of Country Outdoor Theater may shortly take place. In some cases, the family would wait a few more minutes and would go to bed shortly afterwards. The owl continues to Hoot, and more than one pack of coyotes are howling close by. Another enjoyable evening at the “Okonski Homeplace” . 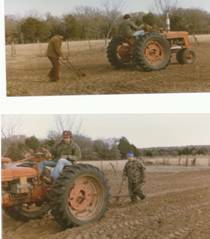 As much work was required to operate the Farm there was some time, especially on Sundays to go fishing. 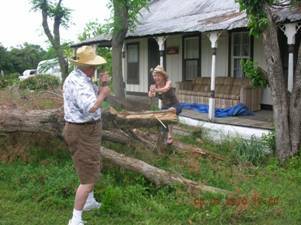 We utilized cane poles made from willow tree or china berry limbs. Someone had to catch grasshoppers or dig earthworms. Most of the time, we walked to the favorite fishing holes in the Willow Creek to catch the perch and catfish. The smaller ones were always placed in a container and let go in the ponds to grow. 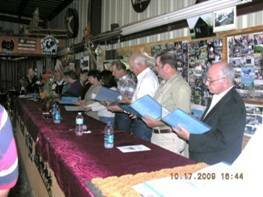 A couple of times a year, we would get to go to the Brazos River for a day or spend the night camping out and checking our trot lines several times during the night. 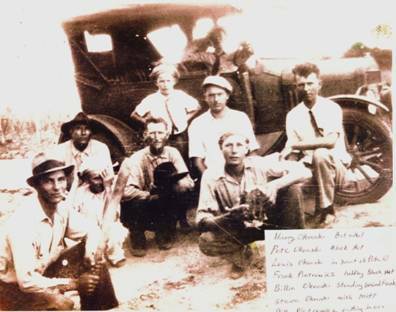 Burning the kerosene lanterns and eating fried chicken or homemade pork sausage with fresh homemade bread was an event not to forget. 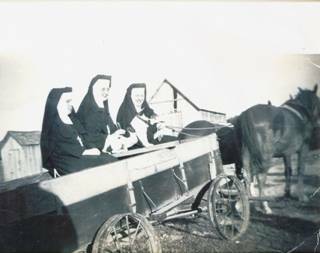 Several times of the year, the neighbors or some of the St Mary’s Nuns would join us in going to the Brazos River or come to the farm to ride the wagon pulled by a pair of horses or go fishing in the ponds. They especially enjoyed the homemade cooking and ice cream hand cranked during the summer months. 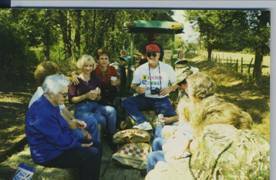 Hunting was also enjoyed by the family and neighbors at the farm. Having 5 adult dogs that varied with special traits for squirrel hunting, raccoon hunting, duck and goose retrieving, snake killing, cattle and poultry chasing, car chasing, ball or stick fetching, and family protection. We had fried squirrel on many occasions. When the neighbors brought their 4 hound dogs and joined our dogs for raccoon hunting for several hours. The dogs were barking while tracking through the woods and creeks with water, was an unforgettable event. A group of 5 or more people would take their 2 or more kerosene lanterns, flashlights, a couple of rifles, some empty sacks for the catch, an axe, and rope and would start their 2 to 3 hour journey with the moon and stars shining and all the night noises screeching and howling. We always came back with several raccoon, ringtail, or some other animals. 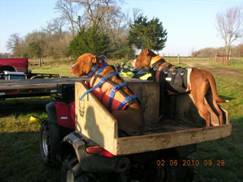 A bad day hunting would be when the dogs found a skunk and got sprayed. Usually, the hide was dried and used on side of beds to dust the feet off before going to sleep and sold the meat to the neighbors. On one occasion in the late 1950’s, a small group went night hunting and came back with a very large albino raccoon. On another occasion, Larry was shooting a 22 rifle at a wild duck sitting on the pond about 800 feet away from the porch. The duck flew away. But shortly afterwards, our large hog stood up in the area and fell over. Larry ran all the way hoping and praying he did not kill the hog. Unfortunately, the hog was bleeding and fell each time it tried to stand up. He quickly placed a lot of mud on bloody spot and hoped it would live. A while longer, the hog stood up and walked slowly back to the house. Larry fed it a lot of shelled corn and any other feed he could find. He could not sleep that night. Early next morning, he ran to the hog to see if it was alive and fortunately it was. Dad never did know about the accident. On one other occasion, Ed and Joe went hunting alone with the dogs and shortly afterwards returned home soaking wet and britches all torn up. The dogs were also home and underneath the house. They said they were near the swamp area a couple of farms away and a bright light came up with a roaring noise and chased them all the way to the house. They said the Jack-O-Lantern chased them. They lost some of their gear and were scared for several days. They did not go hunting for a while after that scary night. Prior to electricity, refrigeration, running water, and gas stoves, living on the farm was a very difficult life. The families were large and everyone had several daily chores. Milking the cows in the morning and evening, feeding the hogs, dogs, chickens, geese, ducks, turkeys, and pigeons, picking up the eggs, cooking 3 meals, washing the clothes, drawing water from the well, and baking bread were only some of the daily chores that everyone assisted in. 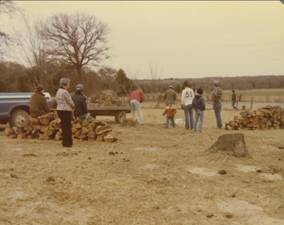 Just getting all the wood for cooking as well as keeping warm during winter months required a lot of effort by several family members. Having a couple of sharp axe and a good 2 man saw were a must to just gather the wood and get it close to the house. Raising enough vegetables and fruit was also a must for both spring and fall. Plowing the garden several times to get the weeds killed and preparing rows for planting were done with horses or tractor and plow held by person. Getting enough help to plant the seedlings raised and the watering required was a back breaking project. The chopping and weed pulling followed the planting prior to any harvesting of vegetables and fruit. Once the vegetables were ready, many jars of canning would be required for a family of seven to plan for all the future meals. We even raised ribbon cane to make our own syrup. There was very little needed from the stores in town except for items such as sack of gladiola flower, sugar, salt, pepper, vanilla extract, baking soda and a few other cooking items. The bushels of potatoes gathered were placed on top of the ground underneath the house where it was reasonably cool and lasted for several months. Sometimes, the parents would trade a bushel of tomatoes for a bushel of peaches or any other vegetable or fruit. Jelly was made from figs, grape, plums, and berries. 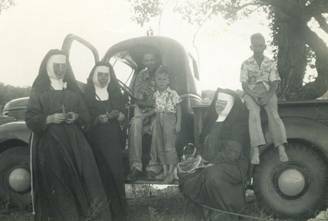 Selling vegetables and fruit on side of Hwy 6 was a source of income to pay the bills. 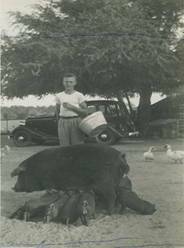 Raising turkeys, eggs, geese, ducks, hogs and a few cattle were the primary source of family income. 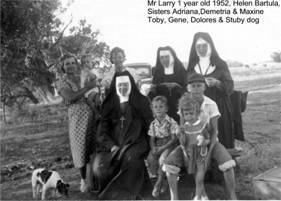 Everyone in the family had many daily chores and also had to work in the fields to raise and gather the various crops. When Ed was born in 1933, Dad had to pay 1 silver dollar and give a cleaned goose to Dr Sanders for delivery services. As soon as the water melons were ripe, the family would have melon twice a day. 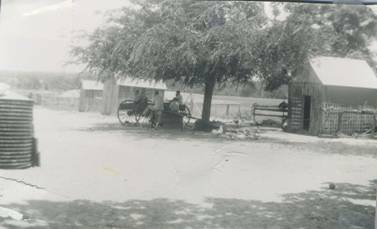 One of our wood horse drawn wagons was parked under a large elm tree that provided a lot of shade and was the place we ate the melon. 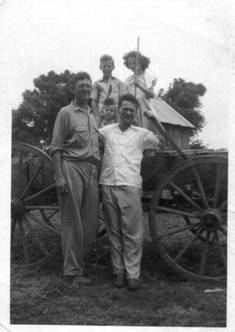 Melon time, Dad would holler Melon several times, and everyone darted to the wagon to eat watermelon. We would get a couple of melons from the stable and someone would bring the knives. If you did not want to use a knife, you could ask for a thin slice to hold in your hands and take bites. We would be allowed to play some games like seed spitting contest unless the watermelon was large and sweet and we would have to save the seed for next year. On hot summer days, a couple of melons were taken to the pond to cool off, while we were swimming. We would have a cool melon to eat when we got back to the wagon under the elm tree. The rhine was given to the geese or the hogs. The chickens would gather the seed that was dumped on the ground. There never was any waist on the farm for anything. Many Okonskis have had all types of animals or favorite pets as they grew up. We had many very special dogs trained to do specific tasks but primarily were man/woman best friend. As the various dogs met their final days, they were all buried in a selected small area known on the farm as the Dog Gone Place on the “Okonski Homeplace”. They were very protective, enjoyed to hunt, (day or night), play go get the stick or ball, catch chickens and gofers, kill snakes, tree squirrels and raccoons, dig holes in the yard, garden and flower beds, and many other good and not so good things. Some of the more famous names were Buster, Blacky, Browny, Whitey, Gray, King, Snowball, Fido, Betchka (barrel in Polish), Tricksy, Suka (Female in Polish), and Stubby. Some rode in back of the pickup, some rode in the front or back seat with their head stuck out the window. One whistle and most were ready to go. On a command of “sickum” or “get him”, they would take off after the cows, goats, horses, cats, strangers, chickens, turkeys or anything that you were pointing at that was note to be where it was. They would jump the fences, push the gates open, jump off or out of the vehicles, and take off after whatever we pointed at. 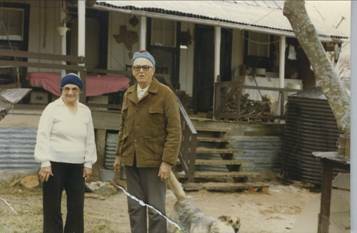 The various dogs had special traits for certain things such as squirrel hunting, raccoon hunting at night, snake killing, car chasing, cattle or poultry chasing, wild geese/duck retrievers, and family member protectors. 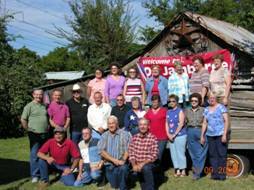 Many large and small planned events occurred at the “Okonski HomePlace” for at least the last 40 years. 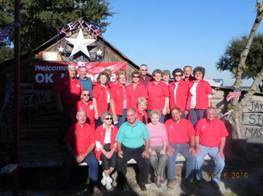 Okonski Jamboree – For the last 20 years, a large party to include many relatives from many cities in Texas and several other states gathered at the “Okonski Homeplace” each Saturday before St Mary’s Bazaar in October. 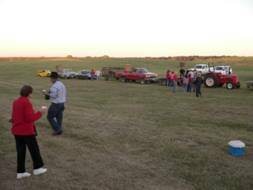 Functions included Catholic Masses, Polka Masses with a large Choir and Polka Band, a band in the evening, a lot of food and drinks, hayrides, family picture taking, and a lot of time just visiting with relatives from everywhere. 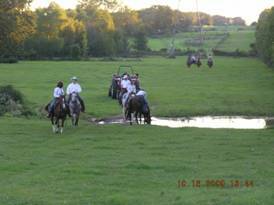 Several trail rides were held on the farm to include horseback riders and several tractor and trailer hay riders throughout the farm or on some of the back country roads. 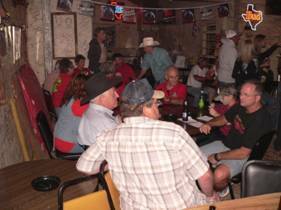 One famous Trail Ride held in 2009 went all the way to downtown Dry Bean and back on a Friday evening. 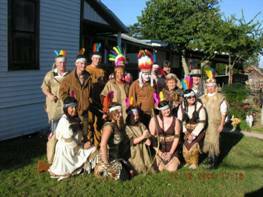 A lot of the relatives, neighbors and friends dressed up as Indians that attacked a group of Trail Riders on horseback at the farm’s Willow Creek crossing. 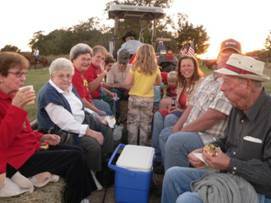 The tractor and trailer hay riders enjoyed the Outdoor Theater that was held one Friday evening at the “Okonski HomePlace”. For the past several years about 20 to 30 Hog Hunter guys gathered for a 2-day Hunt with about 15 or more 4-wheelers and 12 or more dogs to round up the wild hogs. 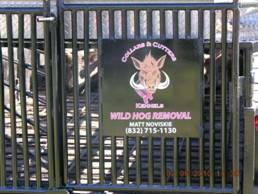 As many as 19 wild hogs were removed during one of the Hunts. 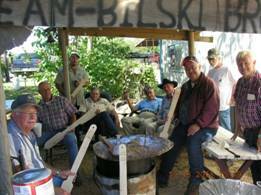 Plenty of food, sitting around a campfire, telling their latest hunting stories, and sleeping at the “Okonski HomePlace” was enjoyed by everyone. 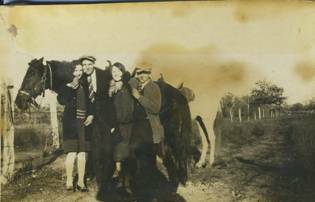 Many family holidays, birthdays, special occasions were celebrated at the farm with someone frying a turkey, making a pot of chili, having BBQ chicken, ribs, brisket or polish sausage and other favorite foods and deserts. Some would play dominoes, pitch washers, throw horseshoes, take family pictures in favorite country spots or just catch up visiting with each other or trading their latest recipes. 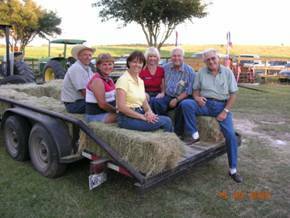 Taking a hay ride throughout the farm was also always enjoyed especially among the youngsters. Joe had a 4H Project in the 7th and 8th grade in St Mary’s Catholic School. Joe picked the smallest pig, about 25 lbs, with a dark deep red color. Each 4H Club member received a pig and would be required to raise the hog to adult size and produce a litter of pigs. The Durock Jersey hog was fed shelled corn which was a manual process with a good corn sheller. The hog was well fed and was taken to an owner of a registered Durock Jersey boar for breeding purposes. The hog’s name was “swinia”, polish for hog, and had a litter of 13 healthy pigs but only a feeding spot for 12 of them. This required a lot of special handling by Joe to manually feed one several times a day while making sure all others were getting plenty of milk and special ground corn. The pigs were raised by Joe and all seven of the boars were purchased by Sears at $25.00 per pig. 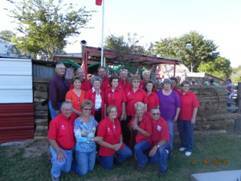 They were provided to next year’s 4H Club members to continue the program. 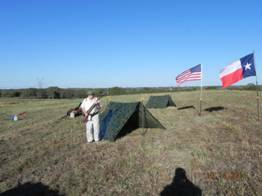 The remaining quilts were used to start a small hog operation which provided some additional farm income. 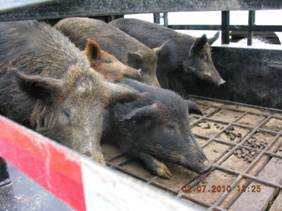 At least one hog a year was butchered, and much of the meat was required to be ground up in patties or sausage links. Without electricity and refrigeration, the patties and links were fried and placed in quart jars for future meals. 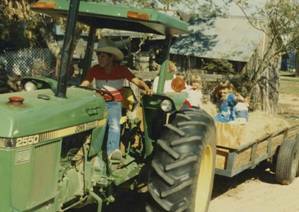 Joe had a FFA project that helped the family survive during the 1950’s and 1960’s. Joe’s first FFA Project was raising a Jersey Cow that raised a calf every year and provided the much needed daily fresh milk. The cow named Patsy, produced a gallon of milk in the morning and in the evening. The milk was utilized for breakfast, baking, and for making ice cream during summer months every Sunday. Stopping by the Ice House for a 25 lb block of ice was a Sunday routine after church. Making homemade ice cream on the big porch at the “Okonski HomePlace” was well known and probably why so many neighbors took turns visiting the place during the summer months. Sometimes the milk was allowed to stand for a couple of days, so that cream would be taken to make fresh butter. The rest of the milk was utilized to make cheese and cinnamon piorgi. Patsy’s calf was generally taken to the Hearne Locker Plant for butchering since the meat was exceptionally tasty. The Jersey cow was utilized into the 1960’s for primarily milking purposes. 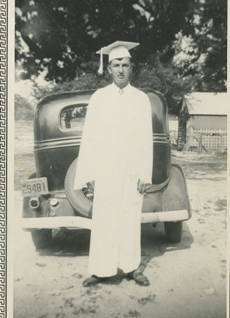 Edward, oldest son, remembers one hot day in June 1950 very well. Mom, Dad, Ed and Joe worked all day long to pull 21 bushels of the best green tomatoes from about a 1 acre tomato patch. A lot of hard work and money went into buying the tomato plants and fertilizer required to get a good looking and producing tomato patch. The pink or ripe tomatoes were placed in separate containers for family consumption. The half rotten ones were placed in old buckets for tomato fights between Joe and Ed and for the hogs. Usually after a good tomato fight, the participants would go to the Pond to jump in with clothes so that most of the tomato stains would be washed off before heading back for home. 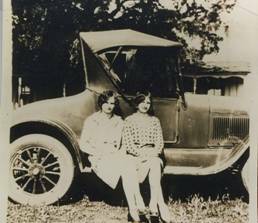 The next morning, all the seats in the 34 Model A Ford were taken out and 21 bushels were stacked in the car and on the outside side boards of the car. 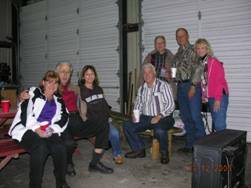 Ed, the oldest son, left early in the morning to get in line at the Abraham’s Tomato Shed in Bremond. 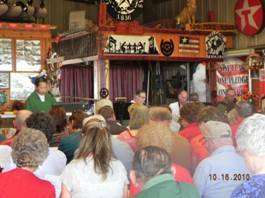 There were many vehicles, horses and wagons, and tractor and trailers in line at the Tomato Shed. 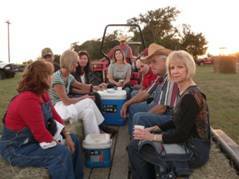 Ed spent several hours waiting for his turn to have the 21 bushels of tomatoes processed. After all bushels were unloaded, he waited for any rejected tomatos and the big check Dad was expecting. It was Ed’s turn to get his rejected tomatoes and check. Ed was in total shock when he had 22 bushels of tomatoes to take back home and a $1.00 check. They said the Company buying tomatoes did not need any more and gave each grower a dollar bill for their gas. He knew Dad would be furious when he returned home. Ed returned home and told Dad what happened. Dad remained furious for many days and worried how all the ongoing bills were going to be paid. Many a jar of tomatoes, tomato juice were canned. Neighbors were invited to take what they could utilize. A lot of tomatoes were fed to the chickens, geese and hogs. Since Ed just graduated from high school, Dad realized that it was time to send him to Houston to get a job and send some money back on a monthly basis to help keep the rest of the family going and ensuring the remaining children received a high school education. 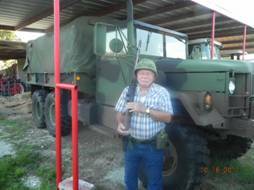 Other than a few toys that were given to us by our Houston relatives, all of our other toys were self-made. Slingshot -- The Y shaped sling shot was usually made from a willow or china berry branch that had a fork in it. The fork needed to be at least ½ inch to 1 inch thick. The two rubber strips that were 6 inches to 8 inches long and ½ inch wide were carefully cut straight from and old tire inner tube. The fork handles were skinned with a knife and the two tops of the fork were slightly itched out. The rubber strips could be folded over each of y tips and tied with some string. A tongue of an old leather shoe would be cut in a egg shaped form and a couple of holes punched with a nail at each end. String was used to attach the rubber strip ends to the ammo leather pouch. 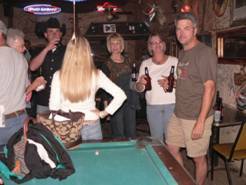 We practiced shooting the sling shot at some cans or glass bottles or just shooting at a piece of metal on side of barn. You could easily hear the noise of the tin when you hit your target. We soon were able to scare the chickens in the yard, punish the dogs for chasing cars on the road, and scare the birds eating the grapes or fruit. The best ammo was small gravel rocks or green china berries. It was fun shooting at the large wasp nests located the small brush or trees. Stick Horses -- We would take turns racing our stick horses around the house 2 or 3 times. The stick horse was made from a 6 to 8 foot china berry branch with a string tied to act as the bridle. If we wanted a two color horse, we would skin a couple of areas of the bark. The winner would have to win all races one after the other. That means the winner would be tired for the next race and could lose. We ran barefooted around the house which was sandy but could have some rocks placed in some areas to avoid soil erosion. Wood Toys -- Many of the small toys were made from some old pieces of wood and small nails or screws. The yard was all sand, so playing in the dirt with self- made toys was a lot of fun. We would build a tractor type grader with a piece of 2 x 4 and 3 to 4 inches of 1 x 4 nailed to front of 2x4. This would easily push in the sand and make our road trails. Sometimes we would find a small piece of pipe and place some wet dirt on top for our bridges. We would nail some bottle caps for our car wheels to a piece of board or stick. Larger toys for making a wooden wagon or a wheel barrow to haul sand, leaves, small sacks of feed, and other chores as picking vegetables in the garden. A paddle type bat was made to hit a tennis ball if we had one or just swinging at some china berries, corn cobs or small rocks. We would also cut some straight smaller ¼ inch limbs to make our own arrows for the wooden bow we made from a willow stick and some fishing string. We would see who could shoot the highest in the air or the longest distance. Most of the cribs and barns were utilized for storing corn and other sack feed. To feed the cattle during the winter months, hay was gathered and placed around a tree fenced off for winter feeding. The hay was transferred by a wagon pulled by horses and taken to the tree and stacked in a circle about 8 feet from center of tree. 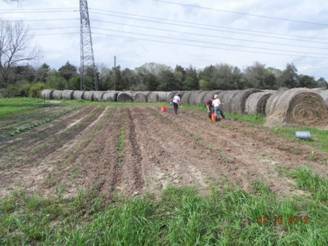 The hay was stacked about 18 – 20 feet high and topped off with an old vinyl table cloth tied with some metal or rocks to keep from blowing away. This kept most of the rain from entering into the hay and rotting it. 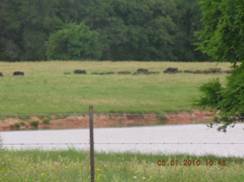 All the cattle and horses were feed with hay or corn tops during the winter. All or our corn fields had their tops cut above the top ear of corn and stacked on small piles to dry for several days. Several small piles were gathered to make a good size bundle and was tied with string. About ten to twelve bundles were stacked around a couple of corn stalks standing up to further dry. After the corn was harvested, the corn tops were gathered on the wagon and taken to another tree to stack similar to the way the hay was stacked. When the tree stack reached about 15 feet, hay was place on top of it and topped off with another old vinyl table cloth on top anchored with some rock or metal. Gathering the small piles of corn tops to make a bundle and tie with string was very scary since snakes including copperheads loved to hide in the cool areas during the summer months. We narrowly escaped getting a snake bite several times. Cutting the corn tops with a large sharpened knife was also very dangerous and several family members have scars on their fingers from past injuries. Plenty of cattle feed was stored with a lot of hard work for each winter months feeding. When Helen was real little, there was a black and white Rooster that would always know when she walked outside, so he could corner her and chase her. She would be looking for him, and he would be looking for her. One day, he caught her in back of a barn, and she knew there was no way out of it. Luckily, there was a rock, about the size of her hand. She picked it up and threw it at the Rooster, and hit him right in the head. He wobbled around a little bit. She was so scared, so she didn’t stay around to see what he was going to do, but she knew that she hurt him. The next time she went outside, she looked for him, but he wasn’t anywhere around. She knew then that was the end of him, and she never told anyone what she did, and no one asked her. She was just so happy that she never had to deal with that mean Rooster again! Again, detail information and many more pictures for the Okonski Family Stories, Family Tree, Favorite Recipes, Good Ole Jokes and Did You Know are located on the Okonski Family.com website. Anyone with additional information or corrections for the website should contact us per the contact information on the website.